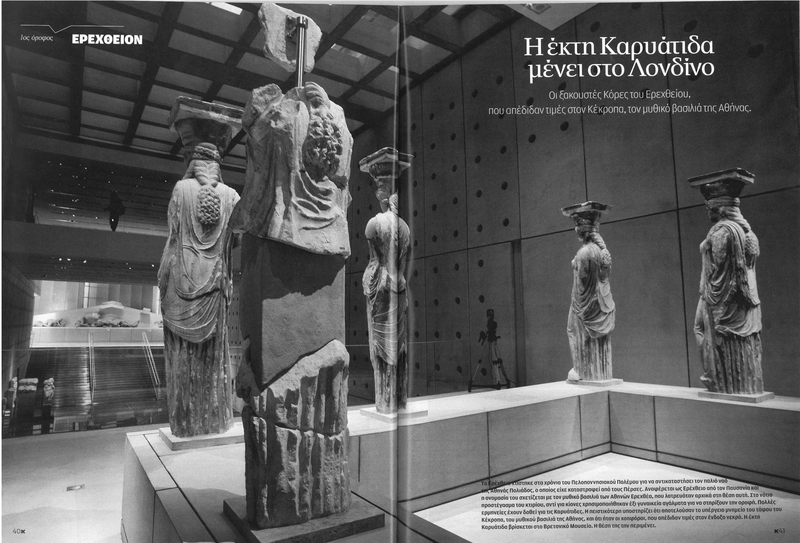 The New Acropolis Museum was specifically designed for the particular location adjacent to the original monument. The architects’ choice was to have the top floor (the Parthenon Gallery) rotated from the underlying building, so as to be perfectly aligned with the Parthenon monument up on the hill. Here the significance of the museum derives from its proximity and alignment to the classical ruin. “It is a building that, quite literally, could not have been constructed anywhere else in the world.” The museum’s design incorporates contemporary exhibition ideas. 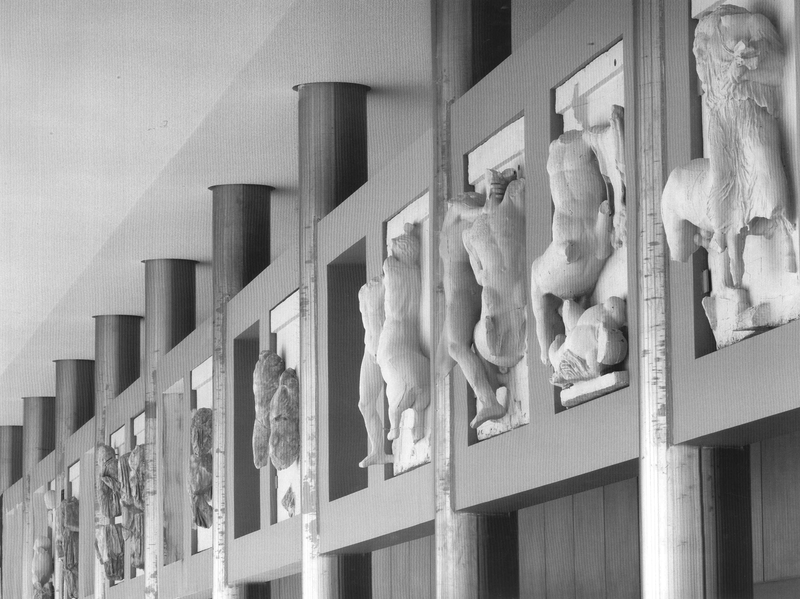 At the top floor, in the Parthenon Gallery, the visitor is presented with both the sculptures and through extensive all-round glazing with views of the Acropolis. 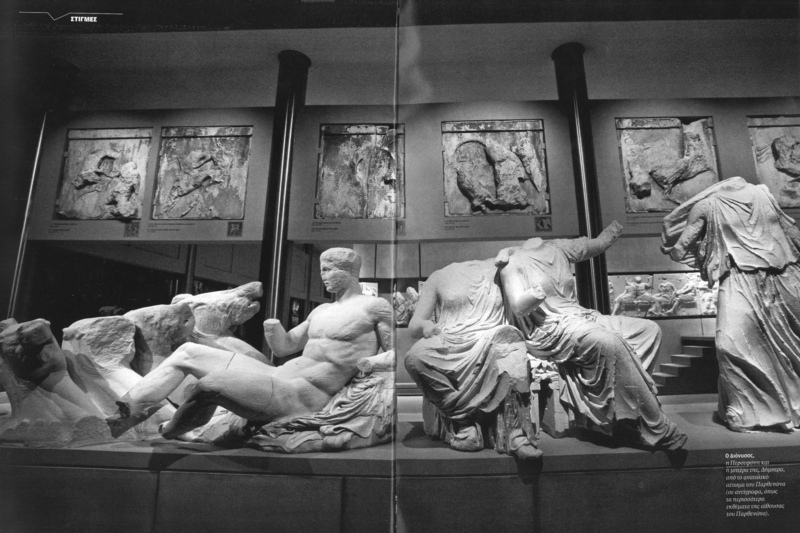 The layout of the marbles of the frieze is according to their original position at the Parthenon, with the missing pieces replaced by easily distinguishable casts. Some information in writing is provided for all pieces and the present location of the original. Although there is a logic of ‘reconstructing’ the analogies and layout of the Parthenon, the perception of the marbles is still very different from the ancient Athenian one. The marbles were seen from the ground at a distance and with a lot of perspective when they were on the Parthenon, as they stood as a decoration at the upper part of the temple. Moreover, they were painted with bright colors, which also gave a very different character to the marbles from the one we see today. In the NAM despite the attempt to recreate a ‘replica Parthenon layout’, there is still a lot of compromise to the artistic perception of the exhibits. The height of the replica arrangement is much lower from the original, presumably to facilitate the examination from the visiting public. The pediments here are also detached and placed at eye level, down close to the visitor.